When you were a child, did you ever have an experience visiting a store or doctor’s office where you felt like the person helping you out didn’t like you simply because of your age? Some children don’t notice in situations where the interactions are brief. Unfortunately, for children visiting the dentist, a dentist who doesn’t like or doesn’t work well with children can be far more devastating. The truth is that, especially in close interactions, a child should be very comfortable with the person who is responsible for their care. When it comes to their health, this is especially important. There are many reasons why not everyone is a pediatric dentist. Let’s look at some of those reasons and why considering a specialty pediatric dentist for your child or children is an appropriate choice. Children’s teeth are different than adult teeth. We all know that, and a dentist especially has to undergo the training to understand many of the differences. However, some dentists simply would rather focus on the treatment of adult oral health issues rather than those involving children. Lost baby teeth, braces in youth, and other issues that require a special knowledge of how children’s teeth develop just may not be a dentist’s cup of tea. It’s important to note that in addition to 4 years in dental school, pediatric dentists have to undergo an additional 2 years of residency training in dentistry for infants, children, teens, and children with special needs. Often times, a dentist comfortable in taking care of both a child’s teeth and adult’s teeth are more knowledgeable and comfortable with their skills in a range of different patients. Income is another factor. While in relative terms, a dental procedure for a child may realistically cost the same as that of an adult, some dentists like to specialize in working with adults so they can attract higher paying clientele. In the end, a dentist who only works with adults and doesn’t take children as patients doesn’t mean they are any more capable as dentists. 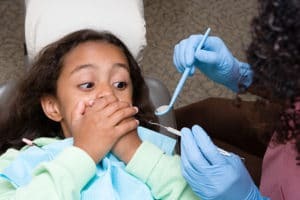 It’s not something many dentists who only treat adults will readily admit to, but some of them just don’t enjoy treating children. Some dentists will even get the training to treat kids, but find they can’t hack it as well as they do with adults. This leads to our next point. 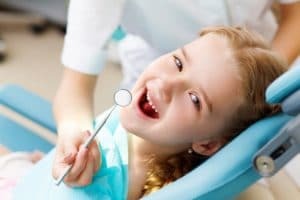 Beyond just having the knowledge to know how to treat dental conditions children will experience, pediatric dentists have to also know how to make their patients feel comfortable. It doesn’t require much imagination if your patient is an adult. When they are a kid, they are going to have unique reservations about visiting the dentist. They may even be quite terrified. Dentists who only know how to ease the mind of an adult will find themselves at a loss when dealing with children. This isn’t to say that occasionally any dentist may be unable to calm a screaming child. The point is just that a pediatric dentist will have a better chance at making the experience a positive one for the child and for the parents. That has value in and of itself. There is no reason to not visit a pedodontist for your children, especially if one is close to you. City Dental Kids & Braces is located at 1233 E 4th St, Suite B, Ontario, CA 91764. The trained doctors and staff at City Dental Kids & Braces look forward to seeing you in their office! Feel free to schedule an appointment for your children today! They will certainly be glad that you did!